This is a piece of wearable technology that I dreamt up on a cold and wet Saturday in February to use in my electric unicycling light painting projects. This project made use of my programming, electronics and sewing skills. 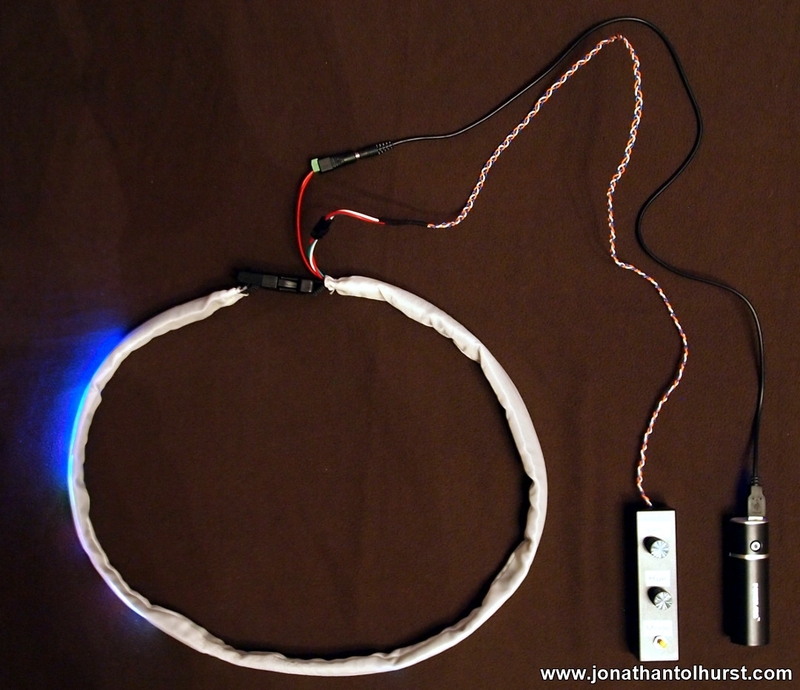 The garment consists of a 144 individually addressable LED strip with a controller and 5 volt portable power source. The sash is designed to be worn over one shoulder. The different modes are cycled though by pressing a momentary push to make switch. The speed, hue and positioning and intensity are controlled by two rotary potentiometers. The battery pack and pattern controller have reasonably long leads allowing them to be hidden away in pockets when riding the electric unicycle. The material in which the LED strip is housed was selected due to the way in which it diffuses the light. A quick photograph as below – I’ll add some light painting images/video at a later date.